Now that I'm retired, Friday is just another day. But for my hardworking husband, Friday is a happy day! I'll be making him his favorite Martha Stewart Oatmeal Raisin Bars today. Given that he's had a tough week (sick, subway taken down for a day, etc. ), I thought I'd slip one of the bars in this cute package (not sure he will care about the package, but I will). I used the We R Memory Keepers Oh Goodie! Glassine Paper (food safe) to make this happy bag. These papers are 12 x 12 and in a palette of fun colors and happy designs. Love them! They'll work great on cards as well. I trimmed the Oh Goodie! paper to 11" x 6.5" in order to make the finished bag, which is 4.5" x 5.5". Used Concord & 9th's Bags and Tags Dies to trim the edge of the bag so there would be a cute top (and finished edge on the back) and to make the tag. Speaking of the tag, I added the stripes, tiny heart, and sentiment from Birdie Banners. Oh, the cute gold sequin trim is also from Concord & 9th. MOOD WHEN DONE = Colorful! Have a great weekend. I think homemade treats in a hand made treat bag is just about the coolest thing ever. Presentation is everything! Such a fun, happy little package to give to your hubby! I love the Bags and Tags dies and have barely scratched the surface of ways to use them! 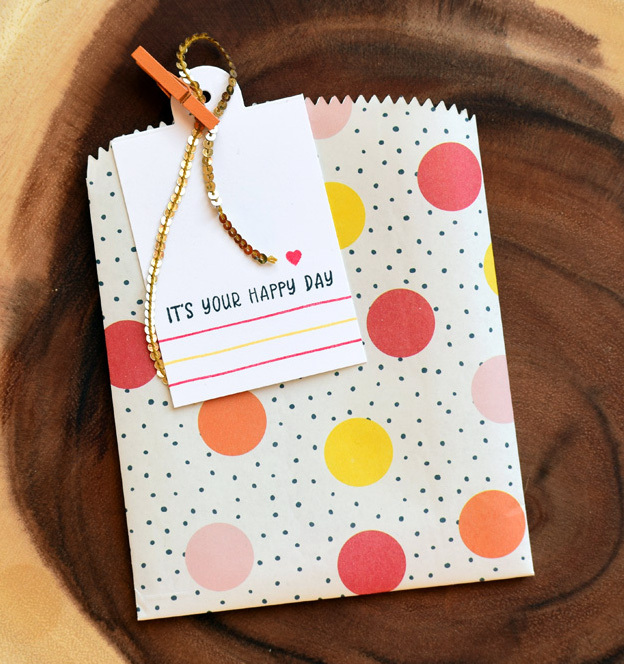 What a cute colorful gift bag and tag! And homemade oatmeal raisin bars inside! Very nice. Awww, how thoughtful of you to make his favorites and then wrap them up so sweetly!